This mine is hosted in archean greenstones and has several distinct quartz vein systems. During mining it was useful to try and relate the quartz vein sets with their Au potential. This was based on vein orientation with horizontal veins considered to be mineralized and vertical veins to be sub-economic. However, decrepitation shows that in the ore zones, veins of both horizontal and vertical orientation have intense CO2 peaks, whereas such peaks are absent on nearby barren veins of either orientation. In addition, multiple samples from a single horizontal vein in the pit wall give very different decrepigrams. This shows that the vein's orientation is not a consistent guide to the composition of its parent fluid and that the veins show strong internal zoning. The similarity of decrepitation of adjacent horizontal and vertical veins also indicates that they formed from similar fluids despite being formed in presumably different stress regimes. 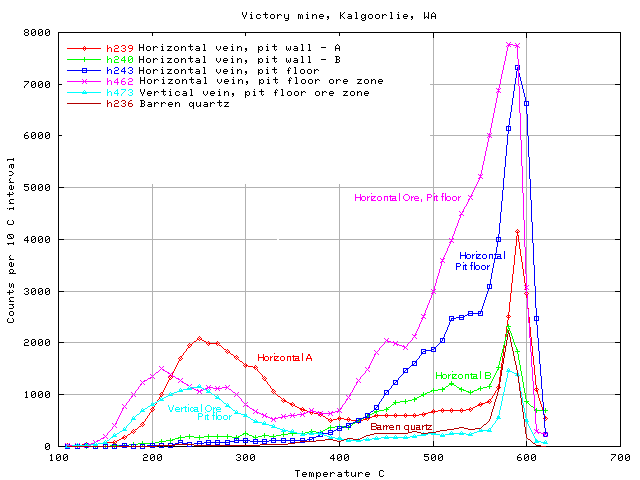 The relationship between mineralization and the presence of CO2 peaks on decrepigrams is more consistent than the relationship with vein orientation at the Victory mine. In these complex environments a technique based on formation fluid content rather than an indirect technique based on geological stress fields is a better guide to mineralization.